To celebrate getting another year older, I had a few friends over and tried out some new recipes. From epicurious. I had never made or even had this American “classic” (according to SB). The presentation, for a salad, was classy and it tasted even better. I used all my favorite salad items plus the peas and cheddar cheese. The salad dressing was the real knock-out success. Next time I need a naughty, delicious dressing I will make this. From epicurious. These nuts were amazing. They had the perfect crispy coating and were so easy. I would never have thought of using egg whites as the binding agent but it worked like a charm. I will be making these again. No recipe for this one. Just find good dates. I like the bulk ones from Whole Foods and good cheese, like Hook’s five year cheddar or a local chevre. Slice the dates in half lengthwise and fill with cheese. This also makes a great snack. I love furniture. I love looking at it in person or photos. I always have to go to the furniture rooms in museums and new furniture stores in cities we visit. Recently I had an excuse to buy a couple new pieces. After a solid six months of couch hunting we found this couch from the 1960’s at a secret, buyer’s club only, mid-century furniture warehouse here in Madison. It is in amazing condition, with original upholstery. It feels and looks brand new and best of all it is comfortable. I have been enjoying watching the Olympics from it. This winter it became apparent that my sweater collection had far out-grown my narrow drawered mid-century teak dresser. I needed a second dresser with large drawers for bulky clothing. After a good search I came across this refurbished dresser at a local store. It holds everything with room to spare. My only complaint is that it has a lingering smell of cologne inside the drawers. It just needs some more airing out. I’m still looking for a new tv console and a lateral file cabinet. The hunt is half the fun! Since I began blogging seven years ago I have always done an annual summary and set some goals for the next year. 2009 was a tough year and I have been avoiding writing about it. Most of the year had a huge cloud of anxiety and entrapment hanging over head because of our house in Atlanta. It didn’t sell and it didn’t sell and the helplessness mounted. In the end we sold it at a significant loss, for which we are still paying off. It wasn’t a happy situation during or after. The unfairness of it all still lingers but life goes on. I went back through my Flickr album of 2009 to be reminded of all the great things that happened last year and it really wasn’t all doom and gloom. In truth life was pretty sweet. – Portland, OR: Twice for work but still had time to absorb some of the beauty including the amazing rose gardens and fun mountain roads. – Utah: For work and play. SB joined me for a tour of two national parks and some time in Park City. Now we want to go back. There is still so much to see. – Cable, WI + Madeline Island, Copper Falls, St. Peter’s Dome and Ashland: Twice, once for the annual Hambrecht summer vacation and once with our friends from Atlanta. We had so much fun I wish they would come with us every summer. – Milwaukee, Chicago, Spring Green: Great regional day trips. – Atlanta: To check on our house, eat food and see friends. It was a bittersweet visit, staying in our empty house. – Knitting, knitting and crocheting: I finished eight projects last year, most on the large side like blankets and a sweater. – Working from home: This was my first full year as a home worker. I tweaked my routines and recognized the need for decompression after the work day. – The pets: Zoe the cat continues to be the demanding princess, keeping us in-line. Lola the dog provides endless entertainment and allowed us to see the area dog-parks in every season. They bring us so much joy I can’t imagine life without pets. – Summer vegetables: Wisconsin summer food is amazing and this year we really took it all in with a CSA membership and our own garden boxes. Not to forget all the great cheese and beer. I’m looking forward to another summer. – Sailing: It was back teaching on Soma for us this year but the old luster just wasn’t there. The season was filled with mechanical failings and strange politics. There are some things that you just can’t get back to the way they used to be. – Wisconsin Film Festival: This was my seventh year volunteering at the festival and we were placed at the big Union Theater. While being on hand for the big shows was fun, I like the higher involvement from working at a small theater. I’ll be back in 2010. – The Husband: Being married to SB continues to be the awesome center of my daily life. Last year he came home for lunch everyday and made me smile. What do I want 2010 to bring? – More travel. I want new and different and tried and true. – More friends. It is time to meet some new people. – More appreciation for the now. Instead of thinking so much about what was missed or lost, think more about what is great about the right now. – More creating. Whether that is through yarn, words, photos or wood, create more and stretch my mind. Thank you for all the comments on whether I should keep the blue argyle blanket or give it away. I decided to keep it and it has become my constant couch companion. I’ve enjoyed how it continues to soften the more it is used. Since my last post I finished two more knitting projects to give away. The first was a scarf made for my sister’s boyfriend as a Christmas present. 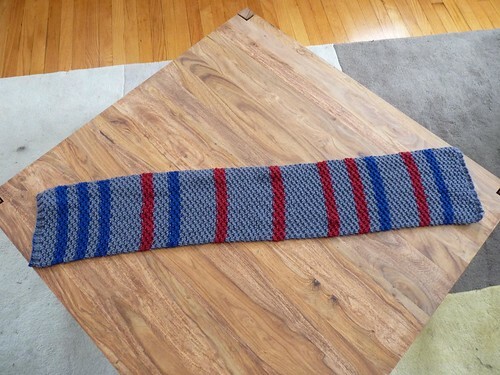 He lives in San Francisco so I wanted a light-weight scarf with lots of texture. 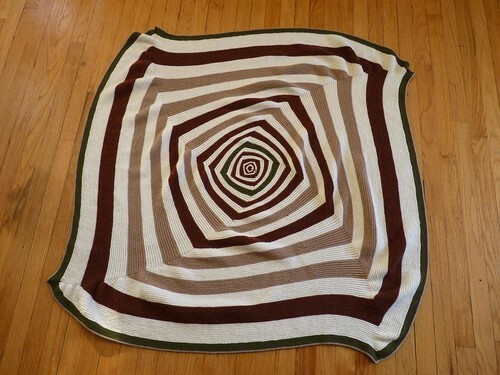 The second project was an op art spiral throw for SB. He loved the first one I made and requested one of his own. I made it slightly larger than the first. While I’ve been snuggled under my blue blanket, he’s been cozy under his spirals.